Summer is just around the corner. You may have started to think about a summer family vacation. 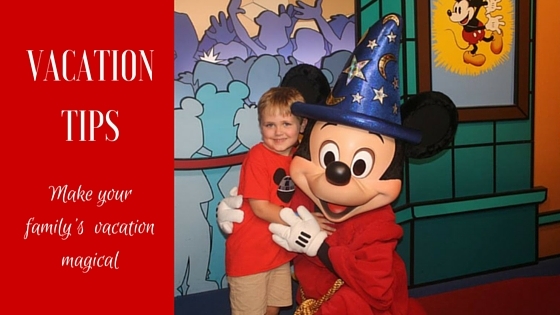 Guest blogger, Jo Varnum, shares her tips for a Disney vacation for ALL children – including those children with Autism. 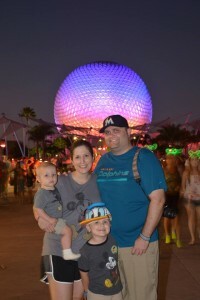 My husband and I love Walt Disney World, so when we found out that our son was on the autism spectrum, we worried that we’d never be able to enjoy our favorite place as a family. After all, what could be more overwhelming to a child who hates noise, crowds, and unfamiliarity than Disney World? Thankfully, after several successful visits with our child with ASD (Autism Spectrum Disorder), I can confidently say that not only can you survive Walt Disney World with a child on the spectrum, but your child may end up loving the vacation just as much as the rest of the family does! There’s a saying that goes, “If you’ve met one child with autism, you’ve met one child with autism.” Every child on the spectrum has different strengths, weaknesses, likes, and dislikes. What worked for our family may not work perfectly for yours, but I want to share some of the tips I’ve put together for families with ASD planning a Walt Disney World vacation. First of all, do all you can to prepare your child so that he or she knows what to experience on your trip. One of the best resources is the free planning DVD that Walt Disney World offers each year. It gives an overview of each park and features several attractions and/or shows in each. It also talks about the resorts on property, the water parks, and many activities that are off the beaten path. Similarly, YouTube is your friend. There are videos of rides, shows, parades, fireworks… pretty much anything you can think of. In fact, one of my son’s favorite videos that we found featured the line in Test Track. So while we waited in line for Test Track, he felt incredibly comfortable and excited (more on lines later). 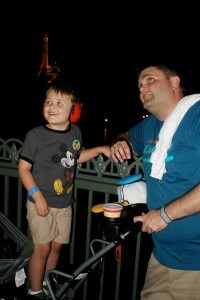 Additionally, Disney World has services in the park available for special needs individuals. They offer a Disability Access Service card to Guests with special needs. You can get this card at Guest Services at each park, and it is not necessary to provide documentation if your disability is invisible, like ASD. This card allows you to schedule a return time for a ride without waiting in line. So, if the line is 30 minutes long, the Cast Member working the front of the ride will note your card, and you’ll return in 30 minutes without having to wait in line. Even if you don’t get a card, don’t hesitate to ask a Cast Member for help if your child is having an issue in the parks. They are trained and experienced to help, and in my experience have always been very accommodating. In fact, some of the most magical moments of our trips have been when Cast Members and characters have gone the extra mile to put a smile on my son’s face. Another tip before you leave for your trip actually has nothing to do with your child and everything to do with you. Keep your expectations in check. This is especially hard for me, because my expectations are very high when it comes to a Disney World vacation. I was concerned before my son’s first visit that he was going to melt down and have a horrible experience. A friend of mine said to me, “he may not love it the way you do, but that doesn’t mean he won’t love it on his own terms.” Those were wise words that I kept reminding myself of as we rode Buzz Lightyear for the 20th time in three days. I’m not saying that your child with ASD has to dictate your whole trip, but in many circumstances it makes for a more enjoyable vacation if you are able to accommodate them. When you’re at home, chances are you do many things all day long for your child with ASD. Take some time to consider how you can implement those routines on your vacation. My son benefits from occupational therapy, so we implement therapeutic exercises in the parks. He enjoys having his legs, arms, and back brushed with a sensory brush, so we do that several times a day. Loud noises upset him, so we brought noise canceling headphones in our bag. You can create social stories for your child regarding the many activities that take place, for instance going through security or ordering food. If your child has been before, or if someone he or she knows has been, show them pictures of the trip. Maybe your child (like mine) loves calendars. If so, make them a customized calendar with pictures of your plans for each day of your trip. Or if your child loves lists or charts, present your itinerary in those ways and let them tote it with them during the trip. These are just some of the techniques that we use for our son, but consider what works on a daily basis for your child at home and think of how you can modify those practices to be used at Disney World. In addition to being a mother of a son with ASD and a huge Disney fan, I’m also a Disney vacation planner. I can walk you through every step of the planning and booking process and help you save money, time, and stress. It’s the perfect way to enjoy all the magic of a Disney World vacation while handing over the stressors to an expert who can plan every detail for you, whether you’re thinking of visiting Walt Disney World, Disneyland, Disney Aulani (in Hawaii! ), or a Disney Cruise. My job is to know all there is to know about Disney vacations and use that knowledge to help others have the best experience possible. And it doesn’t cost you anything! Even better, during the month of April, which is Autism Awareness Month, I’ll be donating 15% of my profits for every trip booked to Marian Hope! I’ve seen firsthand the incredible work they are doing with children and families in our community and am excited to partner with them in this way. If you’re interested in more information or any of the resources listed above, please feel free to email me at jo@simplymagicalvacations.com or check me out on Facebook at www.facebook.com/simplymagicalvacationsbyjo.